The FAA 4C method of test is used to assess the burning behaviour of internal materials used in aircraft or other related vehicles. It is used to determine the flame propagation and after flame time of materials when subjected to a small flame. 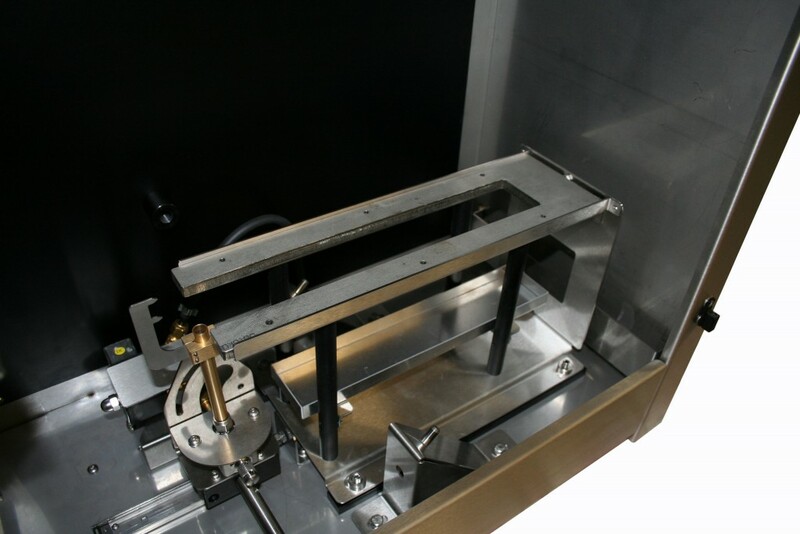 The modular design of the instrument allows testing in the horizontal, vertical and also at 45° to the datum plane. A 60° cable test is also included. All four tests are included with the standard FAA-4C instrument. However, different combinations are possible and can be supplied to customer requirements. For example, the instrument is available with just the horizontal and vertical configurations. Switching from one configuration to another takes just a minute or two, with minimal set up time between tests. The apparatus is bench mounted, ergonomically designed and simple to use and is ideal for use in quality control applications. 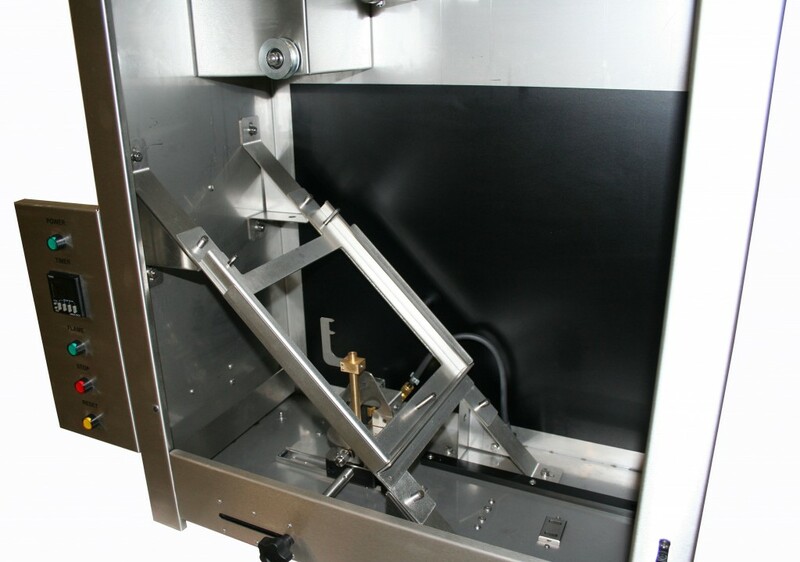 The cabinet is fabricated out of high quality brushed stainless steel and offers automatic start test and a digital timer which automatically controls gas flow and records timed events. A wall mounted variable speed extraction hood is also available as an option to assist in evacuating the contents of the chamber during and after testing. This latest addition to our range of aviation test equipment fully complies with FAA, Airbus and Boeing specifications and reflects the recent changes to the FAA handbook test specifications. Burner Gas Supply: The preferred fuel gas used in the test is methane with a minimum purity of 99%.The pressure required to obtain flame stability is approximately 17.2 kPa (2.5 PSI). Other gases may be used but they must have a calorific value of approximately 38 MJ/m3. Effluent removal: An extraction hood is recommended to be situated above the chamber to take away any smoke effluent produced during testing. We advise a variable flow extraction rate adjustable between of 0-300 m3 /hour. The minimum hood size 850 mm wide x 400 mm deep is recommended. 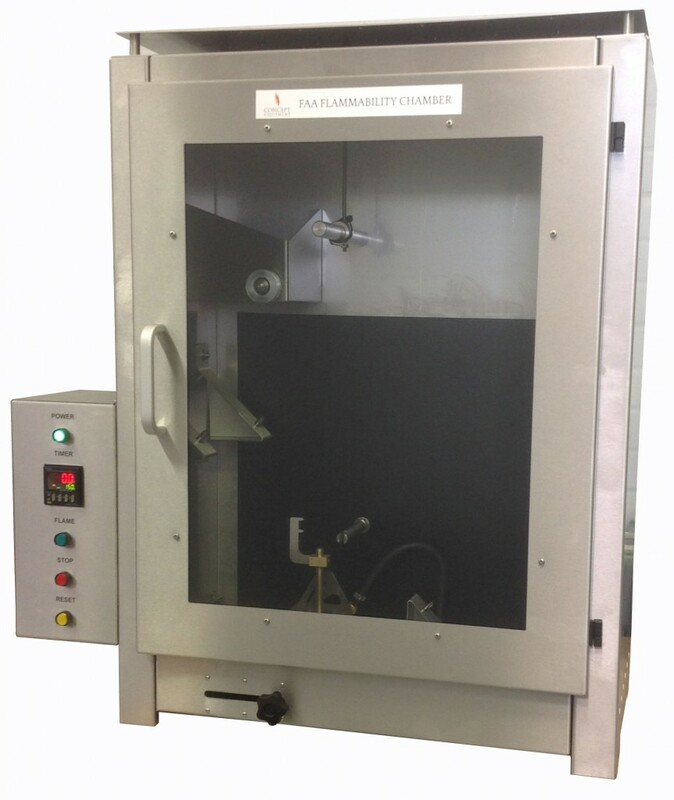 The chamber can also be placed inside a fume cupboard if required. 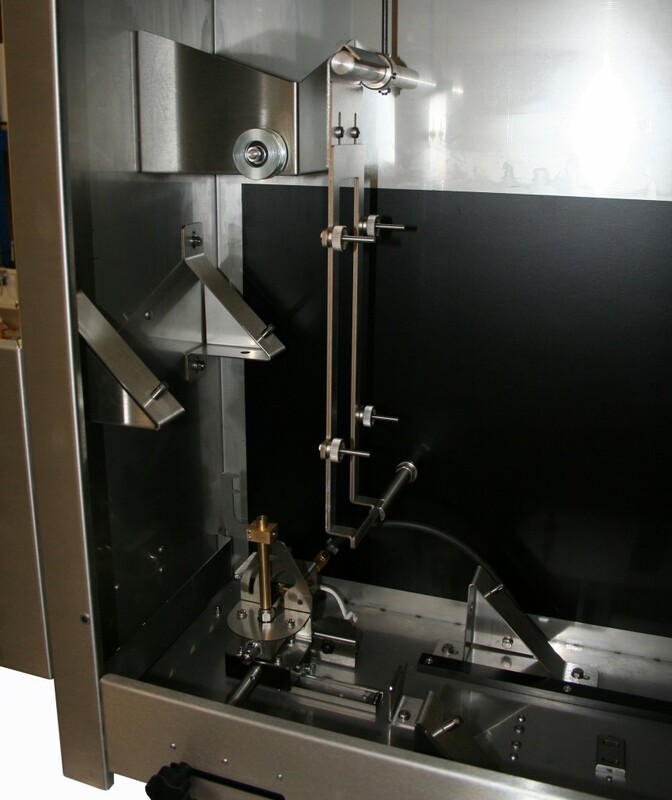 A wall mounted variable speed extraction system is available as an option to assist in evacuating the contents of the chamber during and after testing. Please ask contact us for further details.